Yad L'Achim to hold series of prayer services at holy sites from Meron to Tomb of Rabbi Levi Yitzchak of Berditchev in Ukraine. On Tuesday, Erev Yom Kippur Yad L'Achim will hold a series of extraordinary Tefillah (prayer) events at holy sites in Israel and around the world. Just hours before the Day of Judgment enters, Tefillos will be offered in the merit of donors to the mitzvah of Pidyon Shvuyim (release of captives) for a gmar chasima tova (a good new year) including good income, full recovery from illness, and appropriate matches for those seeking to meet someone and start a family. 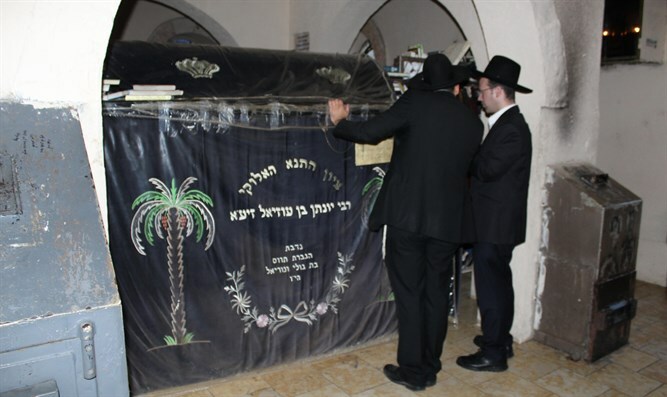 The events, to be held at the Tomb of the Rashbi in Meron and that of the Tana Yonasan Ben Uziel in Amukah, will be conducted by 10 Torah scholars from the holy city of Tzfat. In Eastern Europe, in Ukraine, a prayer event will be held by representatives of Yad L'Achim at the Tomb of Rabbi Levi Yitzchak of Berditchev, the Defender of Israel. Yad L'Achim adds that should it be necessary; the prayers will continue to be recited every erev chodesh of the year until they are answered. It should be stressed that immediately upon publication of the first notice of the upcoming Tefillah events, Yad L'Achim's special hotline was inundated with calls from around the Jewish world. Many callers told emotional stories of yeshuos (salvations) they saw after last year's Yad L'Achim Tefillah events, that were also held for a gmar chasima tova, good income, medical recovery and Divine assistance in finding a match. Yad L'Achim cites known Rabbinic figures that the unique combination of Pidyon Shvuyim, of which the Rambam says there is no greater mitzvah, and the Tefillah events at these holy sites, has the power to break through to the Heavens and bring salvation in the new year.